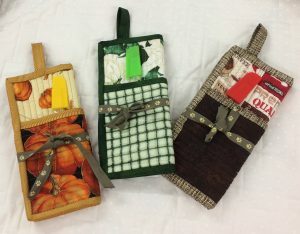 The Falling Leaves Shop Hop continues to march on…..you still have through October 7th to visit 7 great shops and receive 7 fat quarters…..7 patterns…..all “free”. Fun potholders. We’ll be making the potholders in October and the shelter will be hosting their fundraising event at Spooner Market & Grill on November 30th. Great food, prizes and funds raised for the shelter. And we’re also having our annual Christmas luncheon at Pine Brook Farms….this year fondue! Woo hoo. The lunch is scheduled for December 5th. So if you’re interested in getting into the holiday spirit, call and we’ll get you signed up. Enjoy your week! Fall is definitely here. Enjoy the beautiful weather while it’s here.